Renovations to the park include new site paving throughout the park to correct significant water drainage issues, improved and replaced lighting, tree removal and landscaping, the installation of 18 new park benches and new trash receptacles. City Councilman Kenyatta Johnson at the ribbon cutting of the new Stephen Girard Park at 21st and Shunk. 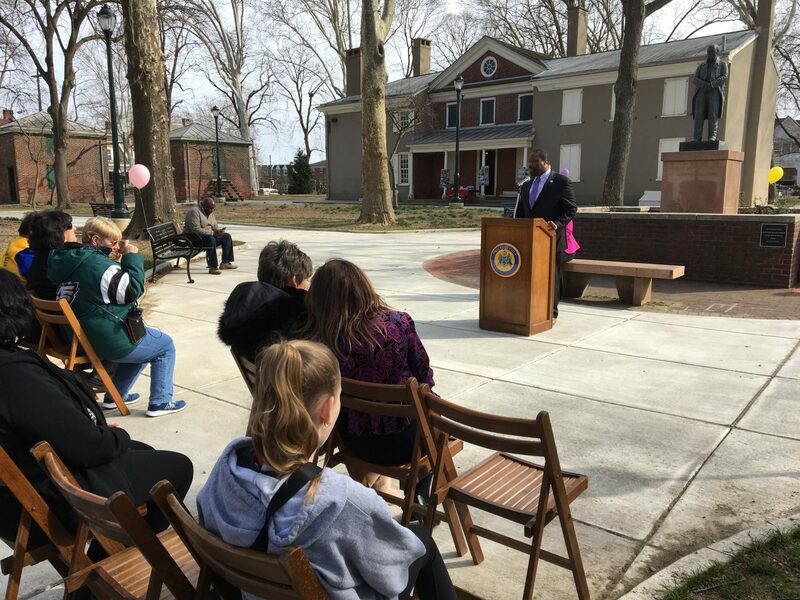 City Councilman Kenyatta Johnson and Philadelphia Parks & Recreation commissioner Kathryn Ott Lovell were among the representatives present at the ribbon cutting of the newly renovated Stephen Girard Park in Girard Estates Wednesday afternoon. Renovations to the park include new site paving throughout the park to correct significant water drainage issues, improved and replaced lighting, tree removal and landscaping, the installation of 18 new park benches and new trash receptacles. According to Lovell, the park cost approximately $1.2 million to renovate. According to a press release, $720,000 of the funding came from Johnson’s office. In Lovell’s speech, she praised Mayor Jim Kenney and the soda tax for its help in raising the money necessary to fund projects like Girard Park’s renovations. “We’re so grateful to our mayor to have the courage to think of this initiative as well as the Philadelphia beverage tax. My motto is, ‘Drink soda, build parks.’ I think it is my civic duty to drink the soda, and I do,” she joked. On the base of the statue of Stephen Girard, which sits in the middle of the park, a plaque was put up thanking Johnson for financing the park’s renovations.